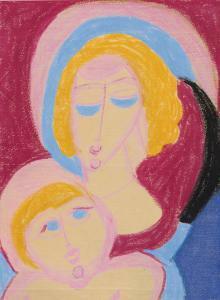 Find artworks, auction results, sale prices and pictures of Aloise Corbaz at auctions worldwide. Faint crease in the paper near the upper left corner. Very good condition. 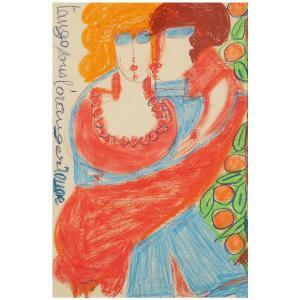 Please note that the work is being sold unframed. Not unframed. Paper is slightly wavy. Paper folded in the middle. In the centre of the composition four tears. One vertical tear along the upper edge of ca. 1.5 cm. Good condition. "In response to your inquiry, we are pleased to provide you with a general report of the condition of the property described above. Since we are not professional conservators or restorers, we urge you to consult with a restorer or conservator of your choice who will be better able to provide a detailed, professional report. Prospective buyers should inspect each lot to satisfy themselves as to condition and must understand that any statement made by Sotheby's is merely a subjective, qualified opinion. Prospective buyers should also refer to any Important Notices regarding this sale, which are printed in the Sale Catalogue. NOTWITHSTANDING THIS REPORT OR ANY DISCUSSIONS CONCERNING A LOT, ALL LOTS ARE OFFERED AND SOLD AS IS" IN ACCORDANCE WITH THE CONDITIONS OF BUSINESS PRINTED IN THE SALE CATALOGUE."